Its name in Latin, Intramuros, literally means "within the walls". Manila was born in Intramuros. It was the center of EVERYTHING during the Spanish Era. It was the center of political, military, and religious power of the Spaniards during its 333-year rule over the islands. It remains a monumental relic of the Spanish period in Philippine history. 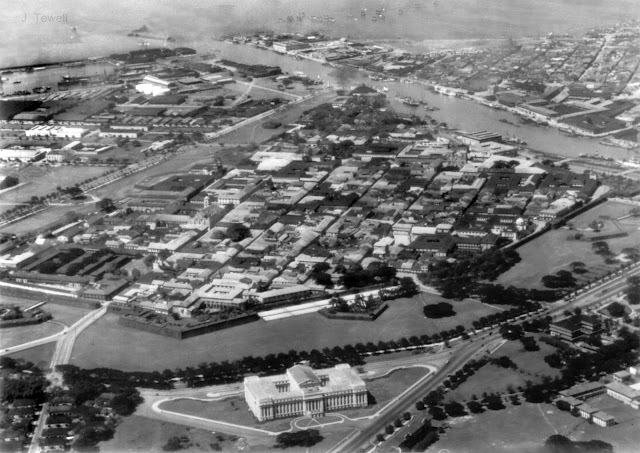 Intramuros was established in June of 1571. Led by Spanish conquistador Miguel López de Legazpi, he formed a peace pact with the Muslim natives who have been settling in the area long before Spain's arrival. The natives gave up the land; hence the establishment of a new Spanish settlement. Miguel López de Legazpi immediately ordered the construction of a new city. He made the Philippines, Intramuros in particular, the capital of the Spanish East Indies. He would also become the first gobernador general of the Philippine Islands. 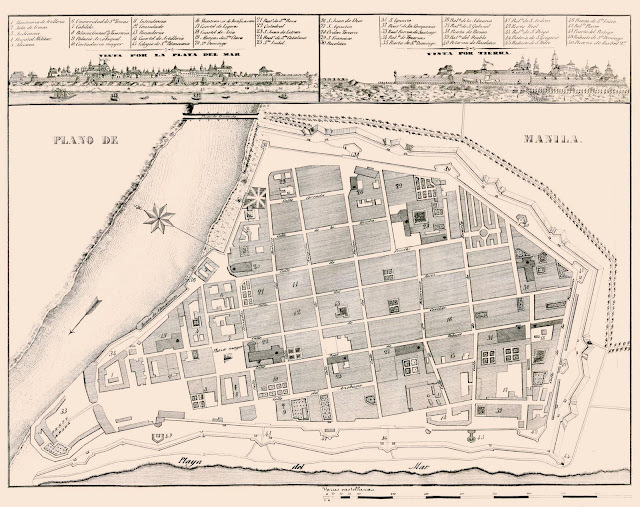 Manila received its royal charter in 1572. Then in 1574, it was given the honorific title of "Ever Noble and Loyal City". 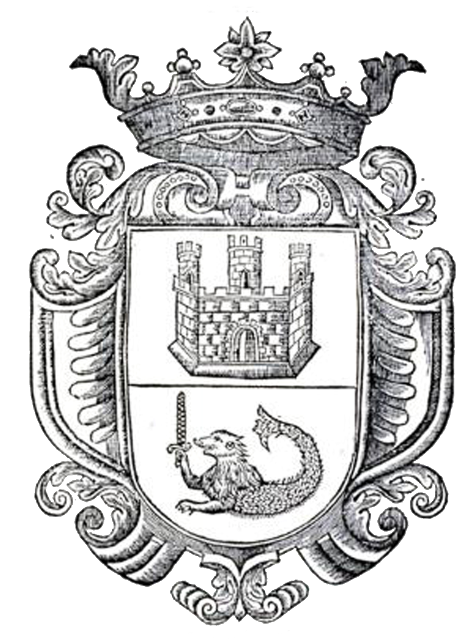 In 1595, it was given a Coat of Arms. For years and years, Intramuros was only made of materials that were weak and were easily flammable. Manila also wasn't spared from natural calamities such as typhoons and earthquakes. The city officials were tired of rebuilding over and over again so they had to think of a solution. Believe it or not, it was only in 1581 that the plan to construct a stone fortified city came into mind. A Jesuit priest named Fr. 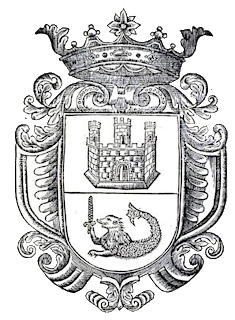 Antonio Sedeño was appointed by Gobernador General Santiago de Vera to design a fortification in Intramuros' southern and most vulnerable flank. Construction of a stone wall began under the governance of Gobernador General Gomez Perez Dasmariñas. The walls of Intramuros were constantly repaired and improved under different governor generals from Gob. Gen. Dasmariñas' time until 1872 when the last recorded work was completed. Intramuros was designed with 51 blocks within the vast walls. The walls were made up of volcanic tuff, stone and earth which made it more impenetrable. A moat was added in 1603 to protect Intramuros from foreign/local invaders. It had 7 gates that were accessible through drawbridges. It went down at 6am and went up again during midnight. Sedeño designed a circular roofed fortification which was dedicated and known as the Nuestra Señora de Guia, the first stone fort of Manila. In 1644, on the site of the Nuestra Señora de Guia, Baluarte de San Diego was completed. 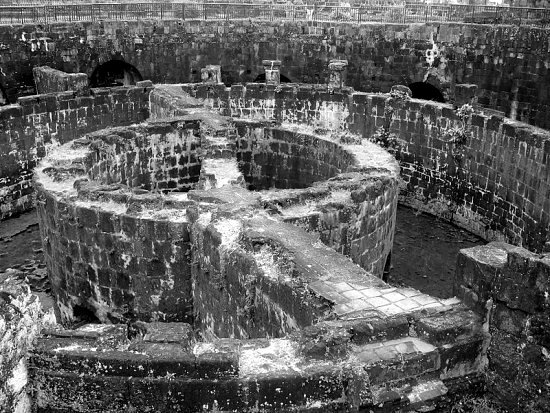 The ruins of the Baluarte de San Diego can still be seen today. The 1645 earthquake toppled portions of the wall and most of the buildings inside the walled city. By this time, stone and mortar were already used as construction materials but this didn't guarantee strength in their structures. This marked the beginning of Arquitectura Mestiza, the fusion of European and local building techniques. Plus, the considerations of living in the Ring of Fire. Manila was patterned after Spanish and Mexican cities. Structures consisted of two-storey stone and mortar buildings that were vaulted in stone. This proved to be dangerous when there's an earthquake. A mixed style appeared consisting of a lower storey of mortar and stone, and an upper story of wood. Stone vaults were avoided. All buildings followed this new method in construction. The only vaulted building that survived was the San Agustin Church built in 1604. San Agustin Church and a typical Intramuros house, 1900. Original pen and ink drawing by Felipe V. Adriano Jr. In 1762, Manila was briefly occupied by the British because of the Seven Years' War. The Seven Years' War was a global conflict between the British and the French. The Spanish government was neutral at first but because of France's string of major losses at the hands of the British, it posed a great threat to Spain's own personal interests. For two years, the British had full control of the city. Eventually, in 1764, power was returned to the Spanish. The British invasion of the city saw the need to improve Manila's defenses once again. To the end of 1800s, Intramuros remained the civic, religious and educational center of the city but trade and commerce were slowly being transferred to the other side of the Pasig, Binondo. 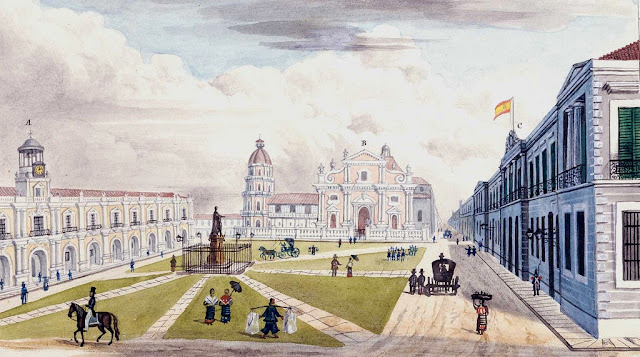 Intramuros, 1852. Plaza Mayor with the bronze statue of King Carlos IV fronting the Manila Cathedral. On the left is the Ayuntamiento, on the opposite side is the Palacio del Gobernador, the two symbols of Spanish power in the Philippines. Illustration by German traveler, Carl Johann Karuth. In 1863, a powerful earthquake rocked the city once again. The Ayuntamiento, Manila Cathedral and the Palacio del Gobernador were severely damaged. The cathedral and the Ayuntamiento were rebuilt but not the Palacio. The gobernador general transferred to Malacañan. Since then, all of the Philippines' rulers took up residence in the Malacañan Palace. 1898 marked the end of Spanish rule in the country because of the Spanish-American War. The Americans' victory in the Battle of Manila Bay formally ended Spain's 300-year rule over the islands. Emilio Aguinaldo declared independence on June of that year and in 1899 the First Philippine Republic was established. The Spaniards who were still residing inside the walls, refused to surrender to the Katipuneros. In December of 1898, Spain ceded the Philippines to the United States. 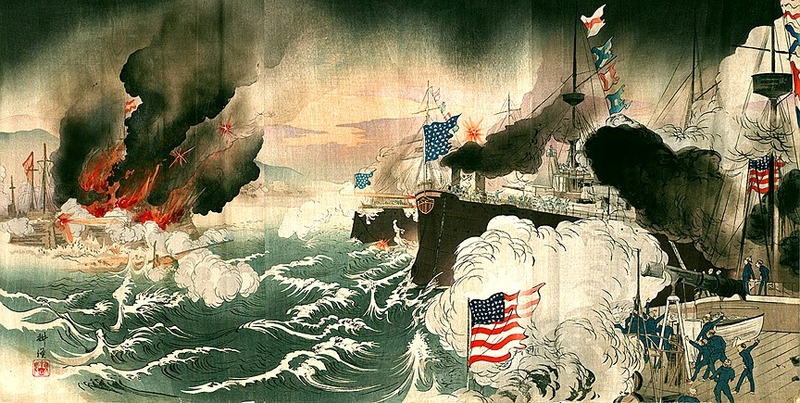 The Filipino-American War broke out in 1899 and ended in 1902. A new era in Philippine history is about to begin. The Americans have taken over. There were a lot of drastic changes in Intramuros during the American period. The Ayuntamiento became the home of the Philippine Commission. The Philippine Commission preceded the Philippine Senate that was established in 1916 in accordance to the Jones Act. Fort Santiago also became the headquarters of the Philippine Division of the Unites States Army. Portions of the walls especially near the Pasig were demolished to improve and widen the wharves by the river. Daniel Burnham went to Manila in 1905 to plan the city. He stated that "The old walled city of Intramuros at the mouth of the Pasig River is one of the best preserved medieval cities anywhere in the world." Part of his plan was to fill the moats with earth and convert it to a green space. It was then converted to a municipal golf course (Intramuros Gold Course) that is still being used today. It is one of the oldest golf courses in the Philippines. The Americans also reclaimed land in Manila Bay obstructing Intramuros' close view of the bay. By the 1920s, civil government had moved out of the city with the construction of the legislature and other government buildings just outside the walled city. 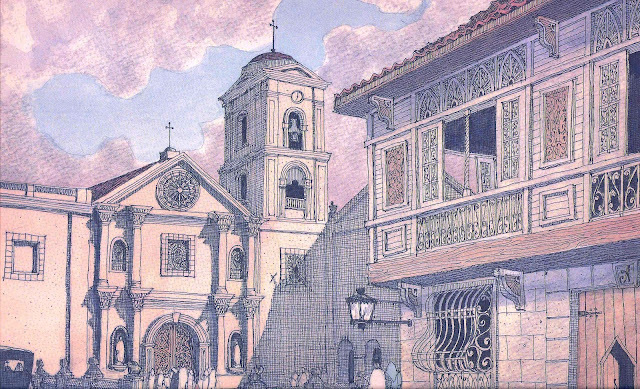 Intramuros remained the center of religion and education in the country. Since the very beginning, religious orders and their respective convent schools have made Intramuros their home. Intramuros originally had 8 great churches. Yes, it had that many. On 12 November 1936, Commonwealth Act no. 171 was passed to conserve Intramuros as monument to the past, this was in response to moves to demolish the walls completely and open the old city for redevelopment. The law also promulgated that new constructions, repairs and renovations keep to the Spanish colonial style. All was well until one tragic event occurred that changed the course of history and the fate of the walled city. World War II happened and Intramuros' old glory was shattered. Three centuries worth of history and heritage was eradicated. 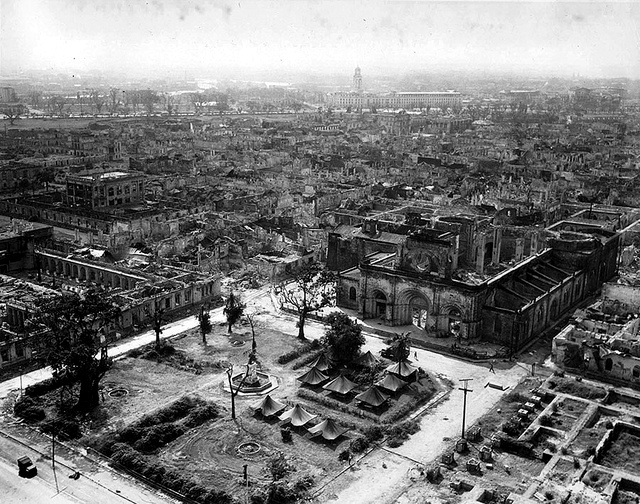 90% of Manila including Intramuros was razed to the ground by bombs of both the Japanese and the Americans. Sad to say, Manila's pearl lost it's shine. Rubble is all that remains of this once rich and thriving city of the Far East. Intramuros, 1945. Manila Cathedral and the whole of Intramuros in ruins. Intramuros' former grandeur remains a thing of the past. A memory that haunts me completely. Feelings of sadness, pride and grief come rushing to mind whenever I see old photographs of our once famed city. Unfortunately, Intramuros wasn't rebuilt completely after the war. It was not restored to its pre-war glory which I find really saddening. The government did not give much attention to the rehabilitation of the old city. Modern, box buildings replaced the medieval Hispanic churches and schools that gave Intramuros that undeniable charm. It makes me really upset and quite mad that a treasure was taken away from us. The least we can do right now, as Filipinos, is to acknowledge what we once had and to appreciate what we presently have. Intramuros still has hope and if we work together, slowly but surely, we can restore Intramuros to its former glory.